Lynda Jacobs is no stranger to an autocross, but that was not the case for the 1954 Chevrolet Bel Air Lynda and her husband, Chris Jacobs, brought to the Fort Worth, Texas Goodguys event. Lynda is usually behind the wheel of a 1966 Chevelle named “Whimpy.” Do not let the name fool you. Lynda and the ’66 Chevelle have not only competed in several races across the country, they bring some fierce competition come race day. 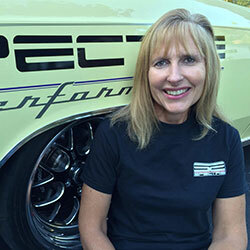 Lynda has been racing on the Goodguys autocross circuit for several years, acquiring plenty of seat time along the way. This defiantly showed, as she was able to jump into the 1954 Bel Air and take the lead in the Hot Rod Class. When the 1954 Bel Air rolled up to the starting line, all focus was directed on car and driver. 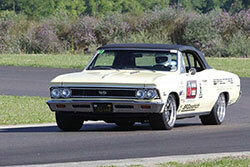 It was rare to see a Bel Air racing around an autocross, especially one that handled well. Texas brought tough competition. A handful of competitors had raced the weekend before at the Goodguys Scottsdale, Arizona event, allowing them to shakedown their vehicles and prepare for the race the following weekend. This would be the first event out for Spectre Performance driver Lynda Jacobs during the 2016 race season. The 1954 Bel Air, owned by Harold and Tracy Chapman, made its way to Texas for a complete shakedown before heading south to Hot Rods and Customs of Andice. The 1954 Chevy Bel Air is anything but stock. Equipped with a complete Roadster Shop Fast Track chassis, the Bel Air has a Donald Hardy LSX 454 supercharged engine with a Bowler 4L80E transmission. The only thing holding the car back may be weight, which came in at 4,199 lbs. Though the Bel Air weighs more than most vehicles that participate in the Goodguys Autocross, it did not phase Lynda as she threw the car around the track. Placing first in the Hot Rod Class meant Lynda would move into the Pro Class for the remainder of the year. Getting into this class is an accomplishment within itself. Many racers attend several Goodguys autocross events with the hopes of making it into the Pro Class, but often fall short. It is always a good feeling to start the year with a win. We will most likely see Lynda back behind the wheel of her Spectre Performance sponsored ’66 Chevelle in the upcoming months. As Lynda continues to race in the Pro Class, she will be facing some tough competition including drivers like Chris Smith and the Spectre Performance sponsored RideTech 48 Hour Corvette, two-time champion Danny Popp in his K&N 1972 Corvette, Kyle Tucker and the DSE equipped 1970 Camaro, and the virtually unstoppable Scott Fraser in his 1966 Cobra. Regardless the outcome, one thing is for sure, Lynda will definitely put on a show no matter what vehicle she brings to the track. Since 1983 Spectre Performance has designed and offered unique, innovative, parts and components to fuel your car or truck obsession. Whether your fixation happens to be a classic muscle car or modern muscle, Spectre will help fuel your passion for performance. Please use the vehicle search tool to find additional vehicle specific parts, or browse the wide array of custom Spectre Performance products. If assistance is required please feel free to call Spectre Performance at 909-673-9800.